Before the first issue of Confederate States Stamps, following the U.S. Post Office's withdrawal of services from the seceded states, postmasters throughout the Confederacy were forced to use temporary substitutes to indicate postal payment. Some of these postmasters created their own adhesive postage stamps, known to collectors as “Postmaster Provisionals”, but other postmasters merely marked letters with either rate-altered hand-stamps or manuscript "Paid" notations. Lets look at the Definition of a “Postage Stamp”: A small, usually adhesive label issued by a government and sold in various denominations to be affixed to items of mail as evidence that postal fees have been paid. If the phrase “A small, usually adhesive label”, in this definition, were changed to “A coin”, would anyone take issue with that? Most certainly today it would pose a problem, but apparently not for the Confederate States postal system during the early years of the US Civil War. Coins affixed to envelopes to pay the required postage were never a sanctioned, approved option. However, many mailings in those early months of the US Civil War used exactly this payment method, and they were readily accepted by the postal officials throughout the Confederacy, as a substitute for Confederate States stamps. Mailed to Lynchburg Va, the cover shown above, has a “Liberty Va. 17 Aug” circular datestamp and a “PAID 5” woodcut straightline handstamp. Notice the mucilage remnants showing an impression of U.S. half dime (similar to the image at the top of this page) that was affixed to the envelope to pay the postage. Once processed through the mails, the half dime was removed and the “PAID 5” confirmation was stamped on the envelope. A very scarce Confederate “coin cover” with a rarely seen clear impression of the coin. A “Richmond Va. Nov. 4, 1863” circular datestamp ties the 10-cent Greenish Blue Jefferson Davis (Scott 12c) on the cover shown above. In the upper right of the envelope are remnants of adhesive and a circular fastener which shows a faint impression of U.S. Dime coin that was attached to pay CSA postage. When being processed through the Confederate mail system, the coin was removed and the 10-cent stamp was placed on the cover and cancelled. A distinctive characteristic of this envelope is that it is a “mourning“ cover. Mourning covers are black-bordered envelopes used for correspondence between family and friends sharing in the loss of a loved one. Especially during the 19th and early 20th centuries, such covers have been carried in the public mail systems of at least 250 countries. 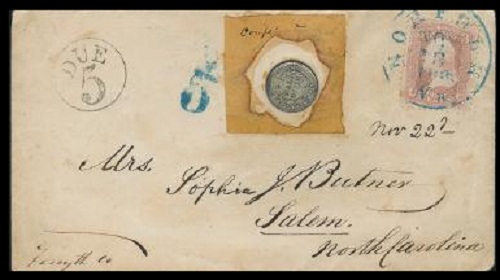 Tied by a blue “Norfolk Va. Nov. 18, 1861” circular datestamp, the U.S. 3-cent Washington stamp on this cover apparently was insufficient postage, and thus the “DUE 5” circle handstamp to the far left of the cover. 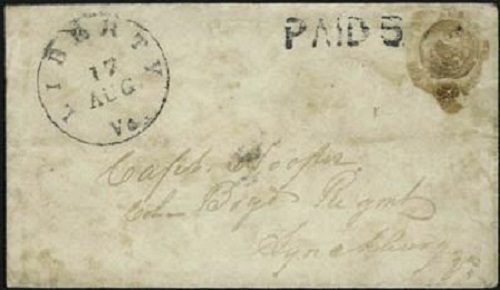 In the middle of the envelope are remnants of brown paper onto which a half-dime was affixed to satisfy the correct postage (a replacement coin for display purposes is shown on the cover). A most interesting item is that this cover was prepared and sent by E. S. Zevely, brother of the 3rd Assistant Postmaster General. An implied, “official” approval of the use of coins as proxies for Confederate States stamps! Steve Swain’s articles have appeared in The American Philatelist, The Philatelic Communicator, Stamp Insider, Georgia Post Roads and other stamp publications on a diverse range of topics such as Civil War stamp envelopes, writing philatelic articles for online “content mills” and the potential income tax advantages of selling stamps.